Media buyers estimate that Flipkart may have spent ₹20-40 crore on endorsement fee for the celebrities, taking the company’s overall festive media expenditure to ₹200 crore. New Delhi: With a play on “Big B", Bollywood megastar Amitabh Bachchan has kicked off e-commerce platform Flipkart’s annual flagship festive sale, “Big Billion Days", appearing in a television commercial talking about discounts and offers. He is joined by A-list stars Deepika Padukone, Ranbir Kapoor and Diljit Dosanjh, who also appear in the 20-second ad spots promoting the upcoming Diwali sale starting on 10 October. Sports celebrities such as Virat Kohli, Mahendra Singh Dhoni, Sunil Chhetri and Saina Nehwal have also been engaged for festive promotions. To woo consumers in the regional markets, actors such as Prosenjit (Bengali), Tamanna Bhatia (Tamil), Yash (Kannada) and director Mahesh Manjrekar (Marathi), have been featured in the commercials. Flush with $16 billion from US retail giant Walmart, the sale campaign is undoubtedly Flipkart’s biggest-ever advertising blitz, which is expected to help the company realize a $1.5-1.7 billion sales target—nearly double of what it did last year. Flipkart’s celebrity splash comes with a big price tag. Media buyers estimate that the company may have spent ₹ 20-40 crore on endorsement fee for the celebrities, taking the company’s overall festive media expenditure to ₹ 200 crore. Flipkart’s strategy to use multiple celebrities seems a safe but expensive bet, said Samit Sinha, managing partner, Alchemist Brand Consulting. According to him, the switch in festive advertising strategy is clearly the Walmart effect, as the US retail giant wants Flipkart to fire all its guns and win the festive sale battle against Amazon. “While the advertising will help Flipkart to make noise and grab eyeballs, it doesn’t necessarily mean that it will translate into sales," Sinha said. “To me, honestly, bringing so many celebrities seems like an overkill. Flipkart could have easily used its ‘kids as adults’-themed ads to create visibility and impact." Flipkart’s catchphrase for the Big Billion Days sale this year is “Ab India hoga budget se mukt (Now India will be free of budget constraints)". The company did not respond to Mint’s queries on its advertising strategy. Unlike Flipkart, Amazon’s festive campaign is devoid of stars. It features big joint families in small towns, married couples and young consumers talking about festive shopping and budget constraints. Amazon has given the campaign a local flavour by creating a musical band, similar to those at Indian weddings, as a mascot. It has the catchphrase “India ki khushiyon ke beech, budget nahi aayega" (loosely translated as “budget will not be a hindrance to happiness"). Sandeep Goyal, media veteran and chairman, Mogae Media, a Mumbai-based marketing and communication agency, agreed: “In online festive sale, advertising product and pricing matters the most. A typical e-commerce consumer will check both Flipkart and Amazon before making a purchase depending on the best deal they are getting." He feels Flipkart may have wasted money on the celebrity campaign. 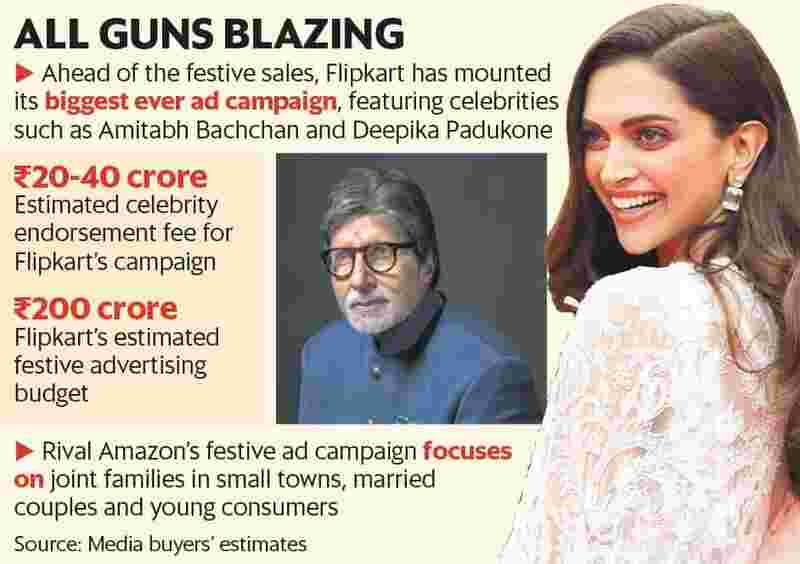 However, Naresh Gupta, strategy head and managing partner at advertising agency Bang in the Middle feels that Flipkart’s celebrity driven advertising could bring new set of consumers online. “It would be interesting to note if these celebrities will help get Flipkart new shoppers who would be transacting first time online this festive season," he said. “Band is a great and unique embodiment of celebration in India which we feel consumers will connect to," said Ravi Desai, director, mass and brand marketing, Amazon India. The marketing push by e-commerce platforms is indicative of a better market and positive consumer sentiment, said Anil Talreja, partner at Deloitte India. “This year the festive sales across e-commerce platforms will definitely be higher than last year because of market stabilization, recovery from financial reforms like goods and services tax (GST) and demonetization and significant discounts and deals," he said. Together, Flipkart and Amazon are leading the ₹ 400 crore advertising blitz by e-commerce firms for the sale period, Mint reported earlier. The two are expected to record sales of $2.5-3 billion during the five-day events this year, according to RedSeer estimates.